I dance to keep my body supple and strong. I dance to keep my spirit grounded and happy and free. I dance to connect to something greater than myself. to share my joy of dancing with others. 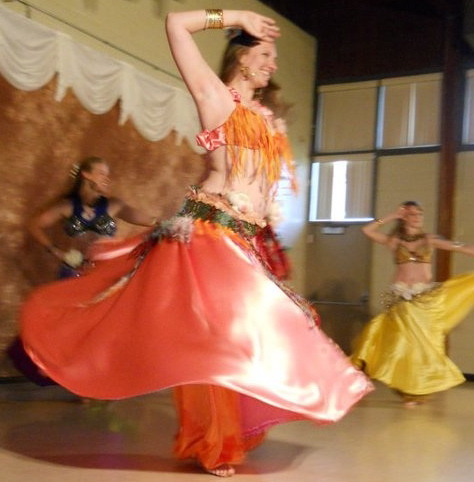 In addition to teaching bellydance, Meaghann Lynne has been working as a professional educator for over fifteen years. While in high school and college, she led performance based literacy groups in alternative education settings with youth at risk. After graduating, she worked with AmeriCorps providing tutoring services in schools, afterschool programs, and community and cultural art centers. She then taught horseback riding and behavior management skills (as a case manager and teacher) to children with severe behavior disorders at a residential home. Most recently, Meaghann taught students with special needs in Intensive Intervention classrooms in the public schools. She received her Masters in Teaching in 2014 from Western Carolina University. Meaghann’s calling in life is to teach and she accepts this gift with responsibility and gratitude. Meaghann Lynne studied acting at the North Carolina School of the Arts and continued her studies in acting, directing, and performance theory at UNC Chapel Hill where she received her Masters in Performance Studies in 2003. Her published thesis is titled, “Play! An Approach to the Scripting and Staging of Collaborative Performance with an Ensemble of Children Living in a Socially Toxic Environment.” She has worked with professional and community theaters since 1995 as both actor and director. In addition to teaching her bellydance format to her students at Waynesville Bellydance, Meaghann teaches improvisational collaborative performance to children in public schools, residential homes, camps, and community and cultural art centers. She also teaches adults in corporate and performance settings. Through performance, Meaghann has learned self-expression, dedication, perseverance, and how to expand her concept of self to include those around her. She has also learned to honor her instincts and cherish her individuality.